I am very happy to receive this Vanity Trove Beauty Box, it is Vanity Trove Malaysia. The box is very pretty and I used it to keep many things that I love. This February 2013 Edition: It's All About Love, the items are hand-picked beauty products to pamper yourself and your loved ones! Now let's check out this after unbox the contain is above picture. The cute tiny box inside contain of chocolates, very sweet! I have got the lovely greeting card too. They are total seven beauty items in the box. ORIKS soft and velvety, the Wild Ginseng Stemcell Twister Essence reduces visible pores while hydrating and nourishing skin. The BB cream is formulated with plant stem cells to repair and keep your skin healthy while covering imperfections. Its unique three tier cream design includes the milk lotion with wild ginseng, the concealer and the serum with repair complex CLR. B.LIV Remove white heads and blackheads gently and effectively with OFF WITH THOSE HEADS BLACKHEADS SERUM GEL! This wonder gel also keeps oil secretions under control and banishes all kinds of skin irritations. RM139 for 30ml, RM179.90 for 45ml. 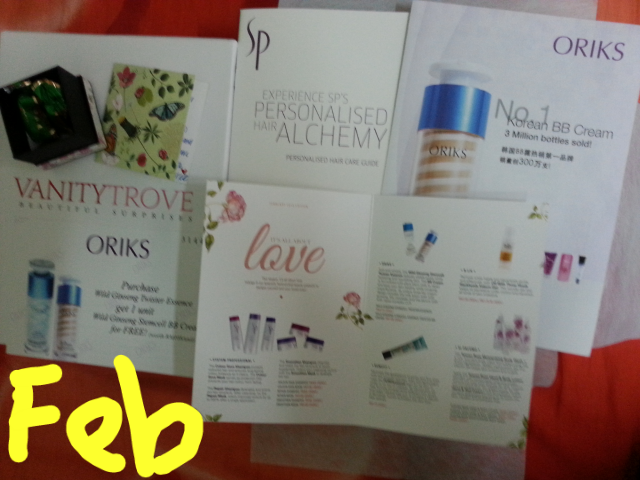 Above is Vanity Trove Malaysia the February beauty box. It's All About Love for this month theme. Indeed a lovely month to celebrate for Chinese New Year and Valentine's Day. This beauty box comes with a ORIKS complimentatary voucher of purchase Wild Ginseng Twister Essece get 1 Unit Wild Ginseng Stemcell BB Cream for FREE! (worth RM108/unit). If you like to get your hands on the Vanity Trove, you can sigh up for an account and subscribe to their service at www.VanityTrove.com.my . A monthly subscription fee is RM60 which inclusive of packing, shipping and handling fees). You can also choose to subscribe for three, six or twelve months, it is up to you. You may sign up the Vanity Trove for your loved ones, surprise her!